yet-another version of chocolate sprinkle cookies! yes, it’s true i’m continuing my mission to recreate conti’s sprinkle cookies. but this time, i am close. very, very close! i found a ‘jumping-off point’ recipe online and then played around with the amounts, with the ingredients and with the baking time. so, of course, now it’s a completely different recipe than what i started with! but i love to experiment, and i love to play around with ingredients, so it’s all good! you’ll notice this recipe is different than others here on thecookieblogger.com, because the original recipe called for grams instead of cups, and so, using my handy escali scale from king arthur flour, i continued measuring in grams. it is one of the handiest tools i have in my kitchen — i use it much more often than i originally expected, so it’s been a good investment for me! i’d be remiss if i failed to mention another tool i used for these cookies — my wilton cookie pro ultra ii cookie press . i find this cookie press easy to use, easy to clean and i love that it comes with 16 different discs! i have had bad luck with other cookie presses in the past, but this one really holds up to lots of use, and it’s comfortable for my carpal tunnel wrists. i’ll be curious to hear what you think of this recipe. the cookies are very reminiscent of those cookies found in italian bakeries or in the greek diners in new york. but, no fear, my hunt for the perfect recipe is not quite over. i will rework this one just a bit to add some more flavor and increase the thickness of the cookies to make it perfectly authentic! 2. in mixer bowl, cream butter and sugar until they are well-combined, light and fluffy. 3. add the egg yolks, sift in the flour and cornstarch, vanilla and almond extracts. mix just until well-blended. 4. using cookie press, place cookie dough on prepared sheets. 5. bake for 12-14 minutes until edge begin to lightly brown. 6. remove from baking sheet and cool completely on wire rack. 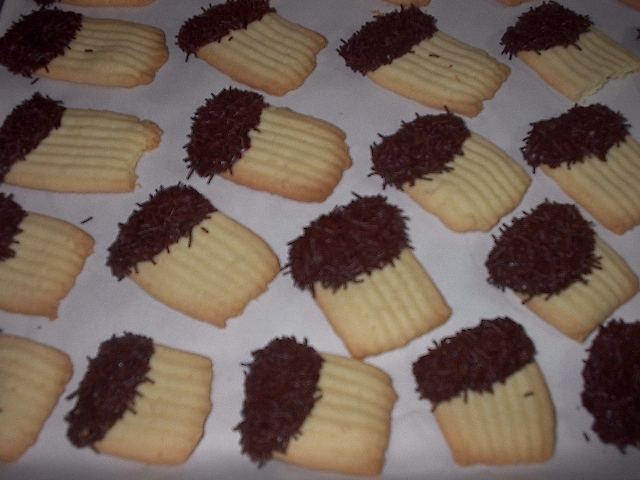 7. dip edges in melted chocolate, and dip in chocolate sprinkles.